We completed the first phase of our Canada 150 project which is to visit all the provinces this year including a representative territory. So far we have visited all the provinces west of Montreal as well as the Yukon Territory. It was a wonderful experience which you can share at Canada 150 Phase 1. We then took a break over the peak summer travel period since we prefer to move in less crowded conditions. Now we turn our focus to the east. First we plan to head out to the Gaspe since we have never been there. We always seem to head toward Edmonston, NB as we approach Riviere Du Loup. We will follow the coast until we reach North Sydney, NS then we hope to catch the ferry to Port aux Basques, NL. After some time on "The Rock" we will head back to NS and work our way to Pictou where we will catch the ferry to PEI. Finally we will return to the mainland probably by Confederation Bridge and head back to Cape Breton where we have about 8 concerts booked at the The Celtic Colours International Festival. 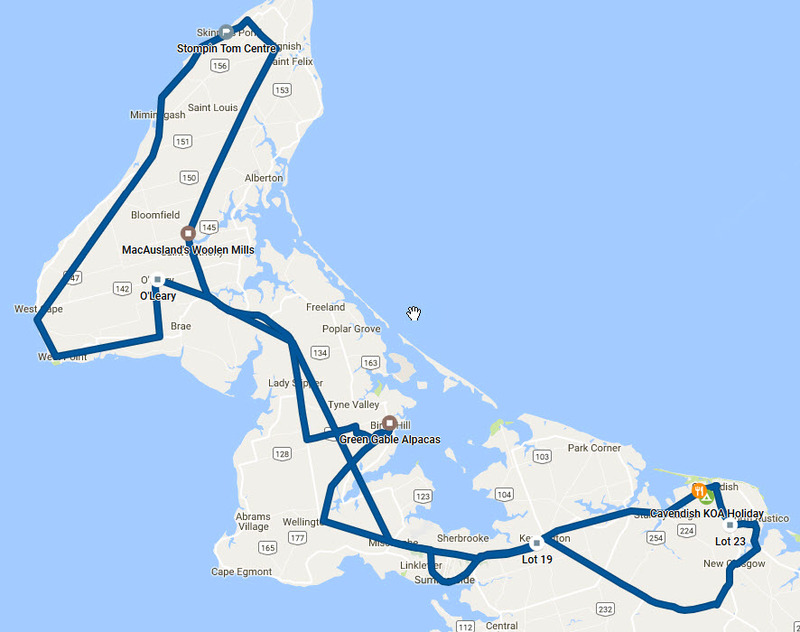 Day 14 - September 13, 2017 - Across "The Rock"
Day 22 - September 21, 2017 - Back To The "Mainland"
Day 33 - October 2, 2017 - New Tires At Last! On the road again after almost 2 months at home other than a week travelling to the Bearded Collie Club of Canada National Specialty in Stratford, ON. We got under way about 08:15 and were surprised to find traffic very light through Lachine, over the Mercier Bridge and on to A30. There were minor delays near St. Bruno but we made our way back on to A20 without undue delay. We enjoyed some wine and dinner and generally spent a quiet evening. We awoke to a rainy morning with no breaks in sight! We enjoyed a leisurely pot of coffee, packed up and hit the road around 08:30 heading east along the 132. What scenery we could see looked spectacular. We stopped for a late breakfast around 10:30 at Le Portage in Matane. While we were eating Lillian noticed a ad for Poissonnerie Matanaise, a fish market selling a lot of local seafood. After breakfast we wandered over and bought some shrimp, lobster and scallops as well as some local smoked salmon in the lox tradition. Most was frozen other than the salmon and some of the shrimp. As we set out from Matane the weather cleared for a while so we were able to better enjoy some of the scenery but as we got further east the rain resumed. We arrived at Camping Griffon about 15:40 and checked in. The rain continued so we hid inside. Rod concocted a pasta sauce that featured fresh Matane shrimp which decidedly boosted our morale. Tomorrow we hope to be able to enjoy the view over the gulf from our camp site and explore the region for the day. Finally, some decent weather! Since we were backed in a site overlooking the Gulf we left the back blinds open. We went to sleep to pouring rain but work up to skies that were still overcast but not raining. The was a good wind blowing (20-30 KM/Hr) which was helping to dry things up. By the time we started moving about the skies were clearing. It was a bit cool (< 10°C) but a distinct improvement. We had a coffee and made some breakfast then set off to explore around 09:45. We followed 132 up along the Forillon National Park to Cap-des-Rosiers where we stopped to visit the lighthouse. This 34 metre high stone light-tower, perched atop rugged cliffs, is the tallest lighthouse in Canada. We wandered our way into the town of Gaspé were we did some food shopping before wandering onwards. We decided to make our visit to Gaspé official by going to see the famous Percé Rock off the town of Percé, Quebec. One of the first things we discovered is that most places expected you to pay $9 to park for the day. Being a bit cheap, we hunted a bit and found a municipal lot that was free. The lot was also adjacent to some buildings from the set of the movie "La Maison Du Pêcheur" a film by Alain Chartrand. It revolves around the true story that traces the summer of the future Chénier FLQ cell, at Gaspé, one year before the October Crisis in 1970. Quite interesting to those of us who lived through that era in Quebec. We took a walk up to a view point where we could get a fairly close look at the rock. We then got back into the Roadtrek and continued a bit down the road to a spot where we could get some pictures of the rock that showed the arch. Lillian would have loved to explore some of the shopping but we were unwilling to cough up the $9. The shops lost. We then wandered back to the free lot where we dropped in to Comptoir Monsieur Émile where we shared a lovely "Crab Bun" and also purchase some of their famous smoked salmon. After that we wandered back to the town of Gaspé where we stopped at the SAQ to resupply our wine stock before heading off to New Brunswick tomorrow. Back a camp we made a nice fire and used it to reheat some BBQ chicken we had left over from home and enjoyed a pretty sunset. Today we were up early to enjoy a lovely sunny and calm morning. We set out a little after 08:00 after a breakfast of bagels, cream cheese and some of the smoked salmon from Matane - excellent! Before heading off toward NB Lillian wanted to pop in to the Forillon National Park visitor center at Penouille. We arrived there about 10 minutes before opening at 09:00 so we enjoyed wandering around and viewing the beach and some of the exterior exhibits. Before leaving we exchanged some money for some pieces of clothing. We next largely retraced out path to Percé and continued on from there after a quick stop for gas. We later stopped for lunch at a canteen at Camping des étoiles near Hopetown. 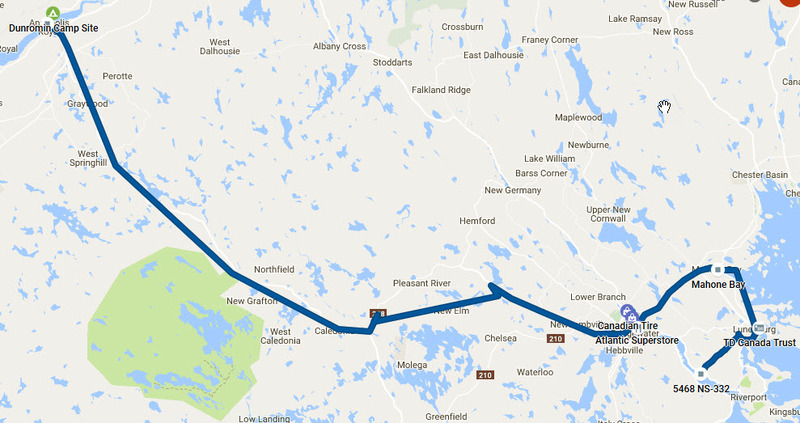 The rest of the run was pretty simple other than a confusing detour near New Richmond due to the bridge over the Grande-Cascapédia river being out of service. We arrived in Campbellton, NB about 16:00 ADT. We first took a look at Campbellton RV Camping a park run by the municipality. While it was convenient clean and functional, it had the typical esthetic of such parks. We decided to move on to Camping Heron Bleu near Charlo, NB. We found that the people and place suited our needs so we set up camp for the night. Since it was Sunday, Rod groomed the Roadtreking Beardie. For dinner we used some of the shrimps and scallops from Matane. We ended the evening sitting around a camp fire. We are now at 7/10 provinces in 2017! We woke up to pouring rain this morning. It had actually been raining a good part of the night. We took a good shot of java to jar us awake then another feed of bagels, cream cheese and lox. The rain seemed to be taking a pause so we packed up and head out about 09:30. The rain resumed as we hit the road but slowly lessened. We stopped briefly for gas at Miramichi but mostly kept rolling. We got to PEI about 13:40 after an uneventful crossing of Confederation Bridge. We stopped at COWS Gateway Village by the bridge to briefly snack and shop. We then headed on to Cavendish KOA Holiday and picked a camp site. We then took off to shop around Cavendish Tourist Mart where we picked up a few food items the headed across the street to Chez Yvonne's where Lillian had a bug (lobster) and Rod had some fish and chips washed down with a bottle of Pino Grigio. All excellent! Good varied menu. We then did a bit more shopping around Cavendish Boardwalk. After that we went to Clinton Hills to see The Ross Family Ceilidh It was a decent show but not exceptional. We finally headed back to camp and took it easy for the remainder of the evening. We are now at 8/10 provinces in 2017! We started the day with the usual coffee after which we both headed to the showers while they were free (included actually). Today we planned to explore the West part of the island with a special focus on wool (Lillian is a knitter). Since dinner was so good we decided to go to Chez Yvonne's for breakfast. A good decision! After that our first stop was Knit Pickers PEI where Lillian picked up a couple of items including a PEI Fiber Trail brochure which expanding our list of opportunities. The next stop was the Trailside Yarn Shoppe near Kensington. Lillian disappeared within for about 1/2 an hour while Rod took Weston for a small wander. Lillian came out with a couple of small items and we hit the road again. Next we moved on to Green Gable Alpacas in Birch Hill. Lillian loves alpaca wool. This place not only had the wool but lots of alpacas as well and a little pug named Otis that seemed to run the place and a llama to guard the alpacas. Rod was the big winner on this stop coming out with a pair of leather gloves with alpaca wool linings. After that we headed for MacAusland's Woollen Mills near Bloomfield. It was an interesting operating mill but Lillian was disappointed in the selection in their store. Still worth a stop for most. Lillian, at this point, declared herself satisfied with the wool hunt for today. Since we were fairly far west, we decided to continue on to Skinners Pond and visit the Stompin’ Tom Centre which opened this past Canada Day 50 years to the day after he was given the "Stompin’ Tom Connors" name in an introduction by by Boyd MacDonald at the King George Hotel in Peterborough, Ontario. We enjoyed splitting a fine lobster roll and a couple of beer at the snack bar before inspecting the shop and display. There is still work to be done but it is a good start. An interesting side note - both our iPods that we use for road and house music today came up with J.P. Cormier's "House of Plywood", a tribute he wrote for Tom who gave J.P. his start many years back. Given a playlist of about 10,000 songs, an interesting coincidence. We then headed back to Cavendish with only a quick stop for gas. By the time we got there it was 18:30 so we returned to Chez Yvonne's for another fine meal. After that we headed back to camp and took a quiet evening. We woke up and took our time breakfasting on the last of our begals, cream cheese and lox. 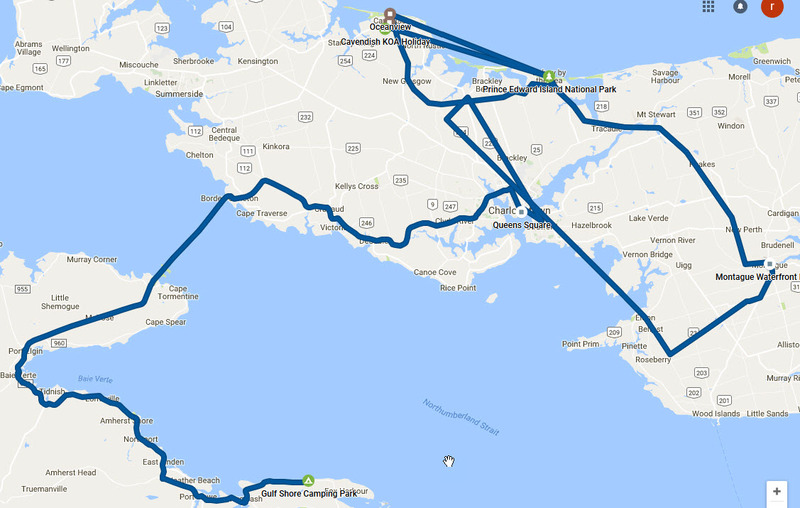 The plan for the day was to explore the east of the island and work back to Charlottetown and probably stay at the KOA near there. Before we left the Cavendish area we made a point to visit the Green Gables Shore of The PEI National Park. We also dropped by Green Gables Heritage Place to take a couple of pictures to say we were there. We then moved further east to look at the next part of the National Park Shoreline. After that we resumed "wool gathering" by visiting Artisans on Main on Water St. in Montague. From there Lillian was directed to visit the mill store at Belfast Mini-Mills near Belfast. When we arrived on the island Lillian requested that we stop in Charlottetown to visit Northern Watters Knitwear & Tartan Shop. 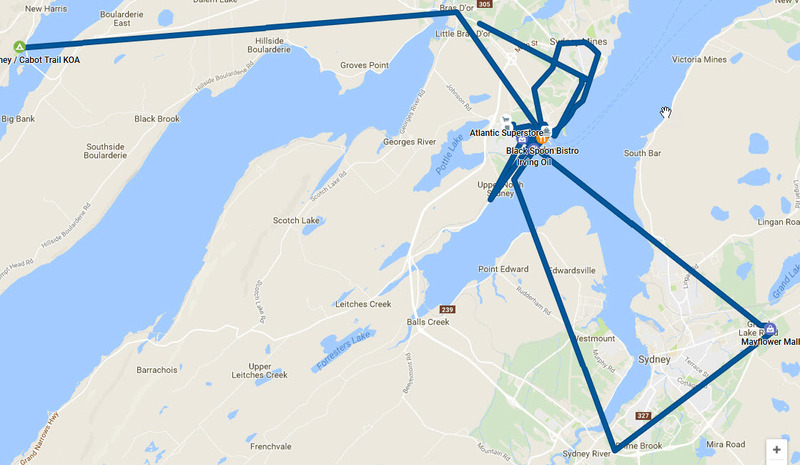 We had been in Charlottetown on a couple of recent cruises so we did not plan to spend extensive time there. Since Row House Lobster Co. was right next door we landed on their patio and made a light lunch of a cup each of their Row House Chowder. We decided at that point that since we had basically accomplished our plans for the island and the weather was forecast to deteriorate, we would move over to the other side of the Northumberland Strait and set up camp at Gulf Shore Camping Park near Pugwash. 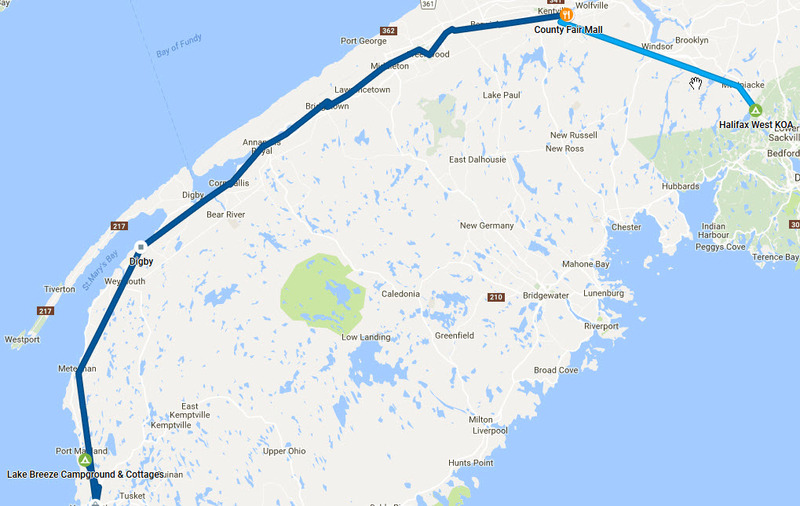 Even though it was almost straight across the strait from us, we had to drive back to the bridge at Borden-Carleton then backtrack to Pugwash and up on to the shore road. We got there about 6 PM, checked in and grabbed a light dinner from the galley. We spent the rest of the evening chatting with some folks from NS South Shore who had a nice fire next to us. We are now at 9/10 provinces in 2017! Only "The Rock" left on the list! After a couple of nice weather days, today is rainy and somewhat windy. Well, you can't win 'em all and we knew this was coming. 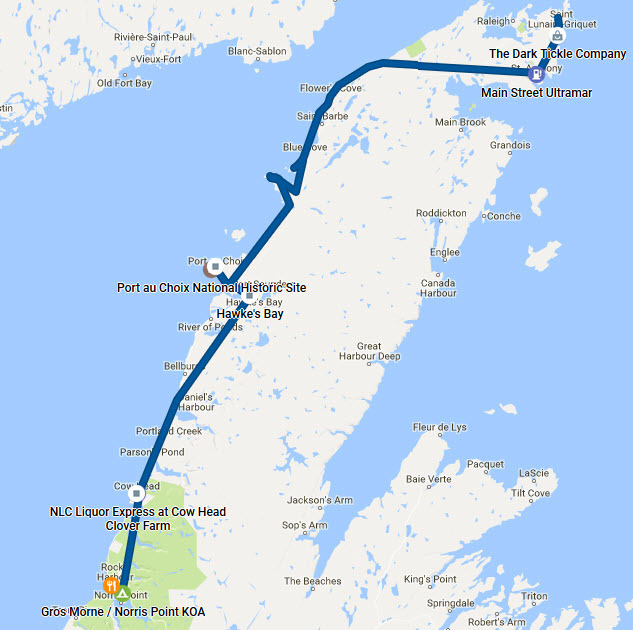 Our main objective for the day was to move up near North Sydney with a view to taking the overnight ferry to Port aux Basques, NL on Friday evening. 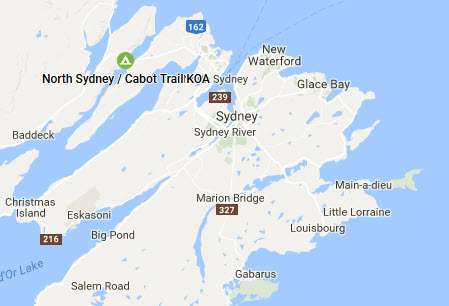 Our specific target was North Sydney / Cabot Trail KOA, a place we had enjoyed a couple of times in the past. Since we were in familiar territory (we used to spend time in the area 12+ years back) we would also use the day to hit some old "haunts". We started out about 09:00 and headed into Wallace to top up our gasoline. While doing that we noticed a new (to us - actually 8-9 years old) cafe across the street called Whirligigs Cafe (sorry - no link). We decided to try them out since we need to kill some time. A great decision - wonderful and innovative breakfasts for each of us. Now that we were past 10:00, we moved on to Jost Vinyards to refresh our supply of "grape juice" and see what was new since we dropped in last year. Our next stop was Country Bread Basket Bakery & Coffee Shop up on Brule Point. We picked up a couple of items then moved on to The Pork Shop in Denmark where we picked a couple more. Now we got back on the wool trail for a bit by visiting Lismore Sheep Farm Wool Shop near River John followed by a quick stop at Water Street Studio Co Operative in Pictou which were both interesting but "economical". From there we hit the road for Cape Breton. We crossed the causeway about 14:30 then did a bit of food shopping in Port Hawkesbury as well as stopping at the Canadian Tire to top up our propane tank. We then beat a path to North Sydney / Cabot Trail KOA arriving just before 17:00. The rain was still hanging about so we made a nice dinner in the galley while Lillian got the laundry caught up. We have the ferry booked for 23:45 tomorrow night so we can relax for a bit. Not an exciting day today. 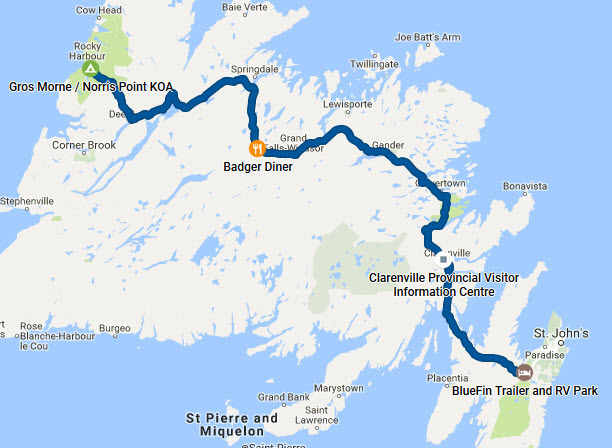 We are scheduled for the ferry from North Sydney to Port aux Basques at 23:45. We have to be there 2 hours ahead but preferably not more that 4. The folks at the KOA let us hang around a couple of hours after the normal checkout time since they were not busy. We finally hit the road about 14:30 and went to poke around the North Sydney area. We actually strayed as far as the Mayflower Mall near Sydney since the North Sydney Mall was a bit of a bust since most of the stores were empty. We then headed back to North Sydney with a view to landing at The Lobster Pound and Moore for a relaxing dinner. It turned out that by the time we arrived at 5 PM they were sold out for the evening. They suggested we try the Black Spoon Bistro which we did. A superb dinner! We finally tanked up with gas and headed over to the ferry terminal about 19:45 and checked in. We explored the terminal a bit (not exciting) and took Weston for a good walk. They started the boarding process about 21:30. Once we were aboard we headed for the bar and had a couple of drinks while we waited for departure. We were still there as the ferry left and the day ended. It was not the best night. We picked a couple of seats that did not recline fully and it was cold in the lounge where we were trying to sleep. Around 03:00 someone loaned Lillian a blanket which gave her some relief. The restaurant opened about an hour before arrival and we were able to have a really decent breakfast for a reasonable price. We arrived in Port aux Basques on time at 07:15 NDT. 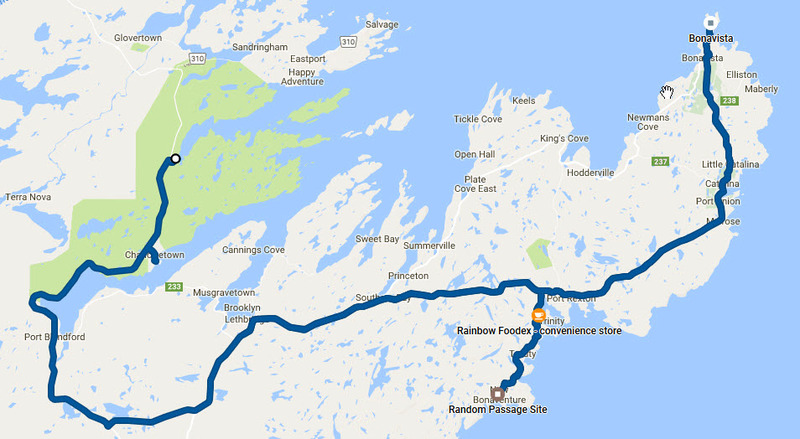 We were unloaded in pretty short order and we hit the Trans Canada Highway or TCH as it is known here. We made a brief stop for Weston to relieve himself and set out for Gros Morne. Brewed on Bernard in Corner Brook for some Lattes and to give Weston another break. We arrived at Gros Morne / Norris Point KOA at about 12:30 where we checked in and just relaxed for the afternoon. We made campfire and cooked the smoked pork chops from the The Pork Shop as the basis of a great dinner. We sat by the fire for a bit then got an early night. 10/10 provinces and 1 territory - our Canada 150 objective is complete. Now we just relax and enjoy our wanders for their own sake! Today our main objective was to get up to the Viking Settlement at L'Anse aux Meadows National Historic Site. We set out at about 10:30 after a leisurely breakfast and kept a pretty steady pace up the road after a quick stop to tank up. The scenery the whole way up was just amazing and we noted a number of places to check out on our way back down. We made a stop at Viking 430 in Reefs Harbour and had a great quick lunch. We got to L'Anse aux Meadows National Historic Site just before 16:00. We managed to catch the last guided tour of the day and our guide was a man who had grown up with sight of the ruins as had worked on the dig and the development of the site. Many fascinating stories about both the site and life in rural Newfoundland. A special experience. We set up camp for the night at Viking RV Park nearby. We had a nice dinner from the galley and I have been trying to get the last few days of this caught up. At first we were not sure they had Wifi and there was no cell service so that backup was out. It turns out theire Internet access is decent so we are getting caught up. We woke up refreshed after a decent night and foraged for breakfast in the galley. It was decidedly cooler and much windier but at least not raining. We set out about 09:00 and headed toward St. Anthony. We made and initial stop at The Dark Tickle Company in St. Lunaire - Griquet. We poked around for half and hour before moving on. We looked around St. Anthony for a bit and stopped for some gas before heading back south on the 430 Viking Trail. As we worked our way along we took some side tours of little coves and towns. We also stopped at Port au Choix National Historic Site where we explored the visitor center and watched a short movie. We also spotted a sign about local shrimp being available nearby and we availed ourselves of that intelligence. Further south as we got back into the Gros Morne park we took a loop through Cow Head where we stopped to purchase some food and "grape juice". We could not complete the loop since the police had blocked the road while they were investigating a fatal road accident so we had to backtrack. Lillian did get a chance to poke through a local craft shop first though. From there we made a fairly direct return to Gros Morne / Norris Point KOA where we took the site across the road from the last time since somebody had our old site. We then headed over to Rocky Harbour to Jackie's Restaurant & Takeout where Lillian had some pan-fried cod and Rod had some scallops. Very good and reasonable. We then returned to the KOA, set up camp and a campfire and enjoyed the remainder of the day. We work to a dreary, rainy day so we rolled over and went back to sleep for a bit. Eventually Lillian made some coffee and the day got under way with a nice breakfast out of the galley. We decided to take a quiet day poking around locally so we told the office we were planning to hang about. We finally set off about noon heading up the 430 to Lobster Cove Head and worked our way down Main Street North into Rocky Harbour. As we did we stopped at a number of craft and gift shops such as Gros Morne Crafts, Endicott's Crafts and others. We also stopped at Gros Morne Wildlife Museum which houses over 100 full-size Newfoundland animals in realistic scenes. It was quite interesting. It is amazing how many species were "introduced" by man onto the island for various reasons. We had our eye on the Boone Bay Marine Station and the adjacent Cat Stop for lunch but they were largely closed for the season. Based on a couple of recommendations we headed to Earle's back in Rocky Harbour. Good choice. One thing we have noticed in the last couple of days, the tourist season here winds down pretty promptly after labour day - even more so than in PEI. We then, after a couple of other shopping stops, headed back to Gros Morne / Norris Point KOA where we generally relaxed for the rest of the afternoon and evening. We woke up to a overcast, drizzly day. Hardly ideal for enjoying the scenery around Gros Morne so we decided to head east with Gander as a rough target for the day. 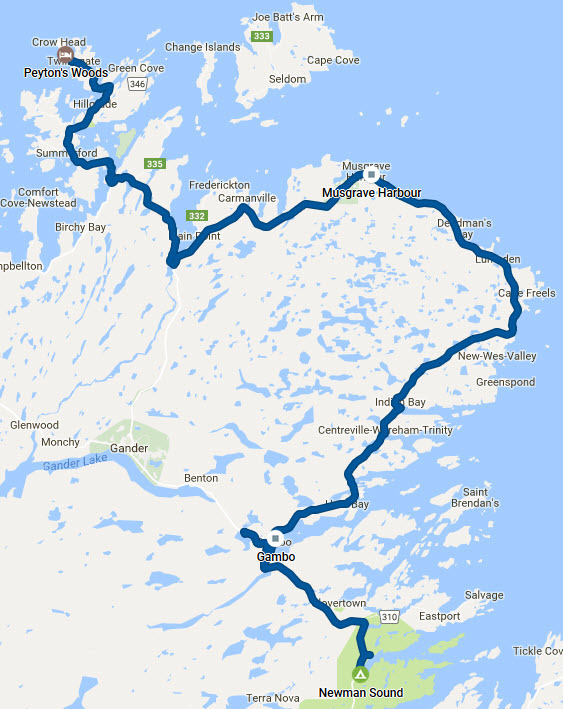 We set off about 09:00 after a casual breakfast from the galley and worked our way back down to pick up the Trans Canada Highway (TCH) at Deer Lake. We just got rolling on the TCH when all came to a halt about 4-5 KM short of the exit for route 401 to Howley. It seems there was a big accident earlier where a couple of pickups did a head on. It took us about an hour to get rolling and get past. The scene remaining showed that it was a massive accident. We resisted taking any pictures as we passed. Other than a quick break at an information center (bunch of panels) with an adjacent convenience store to give Weston a quick walk and similar for ourselves, we made steady process to Grand Falls - Windsor. We got off and went looking for a snack and a food store. Exploits Valley Mall where we found Valley Restaurant where we had a snack. We also found a Royal Bank for some cash, Loblaws/Dominion for some food bits and an NLC Store for liquid needs. As we got under way again we noted that it was getting pretty late so we decided to look for an RV park nearby. The first 2 we tried were both closed for the season. As we were leaving the second a young man leaving the area in his pickup gave us a card for his camp Brookdale Country Inn & RV Park which was open and on our planned path. We took his advice and got a decent albeit small full-service site handy to the facilities. We made a fine dinner from a steak we picked up at the mall and relaxed. Another leisurely start and breakfast not to mention chatting with neighbours. We finally hit the road about 10:30. Our first stop was The North Atlantic Aviation Museum. The museum highlights Gander’s significant role in the development of Trans Atlantic Aviation. We also have a special interest in their dedication to the Atlantic Ferry Command since Dorval Airport (now Montréal–Pierre Elliott Trudeau International Airport) started its life a key player in that mission. It is a nice display and also looks a Gander's role in the 9/11/2001 events. We then turned north toward Twillingate to enjoy the scenic Kittiwake Coast. It was a beautiful drive on a lovely day! We stopped for lunch at Doyle Sansome & Sons on New World Island. We first let Weston out for a bit and met a nice couple from Whitehorse. One of the folks from the restaurant also popped out to join the discussion (quiet day). Weston does attract fans! We were told that, if we were eating on the deck, he was welcome to join us. So he did!. We had a bowl each of amazing seafood chowder - a meal unto itself - and share a plate of sautéed scallops. That would be our big meal for today. Love all this fresh seafood! We moved on to Twillingate and poked around a bit. 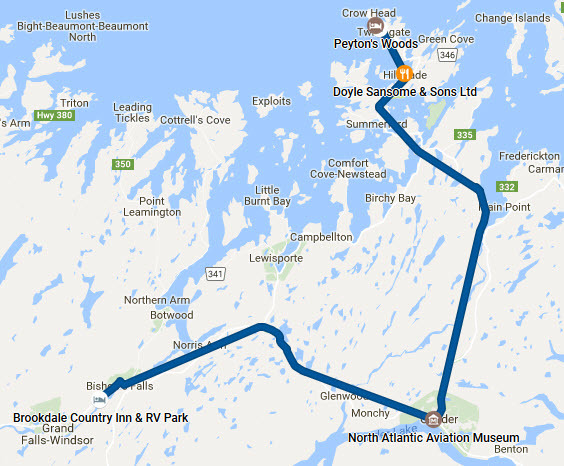 We decided to find a place to camp for the night and settled on Peytons Woods RV Park & Campground right in Twillingate. We set up camp and relaxed for a bit. Rod took a nice long walk along the waterfront which you will eventually see in the pictures. A grand day. They had a "chip wagon" near the entrance to the park which provided a light supper. We got up and got under way a bit earlier than average today since the jack hammer unit was coming back about 8:30. The new owners of the camp are working hard to make it even better but it is a noisy process at this stage. We grabbed a quick bite and got under way about 08:45. We decided to continue our tour of the shoreline by following NL 330 (Road to the Shore) backwards to meet the TCH at Gambo. It was a beautiful drive on a nice day. Not too many pictures since all the view was to the driver's side so Lillian had a hard time shooting. We stopped and poked around Muskgrave Harbour for a bit but generally kept on the roll until Gambo. Before heading east along the TCH we backtracked a bit to see the status of a potential RV park for our return trip. It was a challenge to find and we discovered it was closed for the season. In the process we spotted and stopped at Joey's Look-Out where we made a stop to enjoy the scenery and grab a bite and the snack wagon there. Once we were done we headed east on the TCH to check out other potential camping locations. We stopped at the visitor center for Terra Nova National Park where we found out that the Newman Sound Campground was still open for a while yet. We used that intelligence to head right there and set up camp for the day at a somewhat early 14:35. We spent the remainder of the afternoon on some housekeeping tasks and general wandering about this beautiful park. Today we set out about 09:30 after a light breakfast. Weather was overcast and cooler but still pleasant so we were off to explore The Discovery Trail out along the Bonavista Peninsula. We explored a number of towns as we worked our way to the end of Cape Bonavista to see the lighthouse and scenery. While we were there we stopped at Little Dairy King for a bite of lunch. We then set out to see the Random Passage Site constructed in 2000 for the filming of the international TV mini-series “Random Passage” and subsequently retained as an example of an outport town ranging back to the 18th and 19th centuries. Our guide for the tour was very interesting since she was born on a subsequently relocated outport town and later worked at many of the activities shown in this display. Our original hope had been to work our way down to the Avalon for the night but we were running so late and the weather had sufficiently deteriorated that we headed back to Newman Sound Campground where we were able to reclaim our old site. On the way were we able to pick up some chicken pieces which made a nice light supper. Today we were primarily going to shift camp to the Avalon somewhere central like Holyrood. 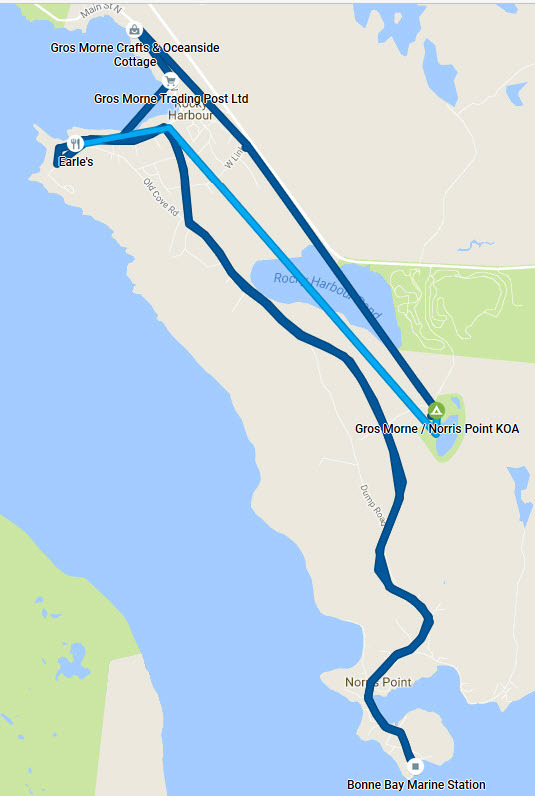 Our initial target RV park was BlueFin Family Park which we knew was open and near Holyrood but had 2 locations on Google Maps and a different one on the Garmin GPS. The web site was not specific as to location. We hit the road about 8:40 and made our was east on the TCH. 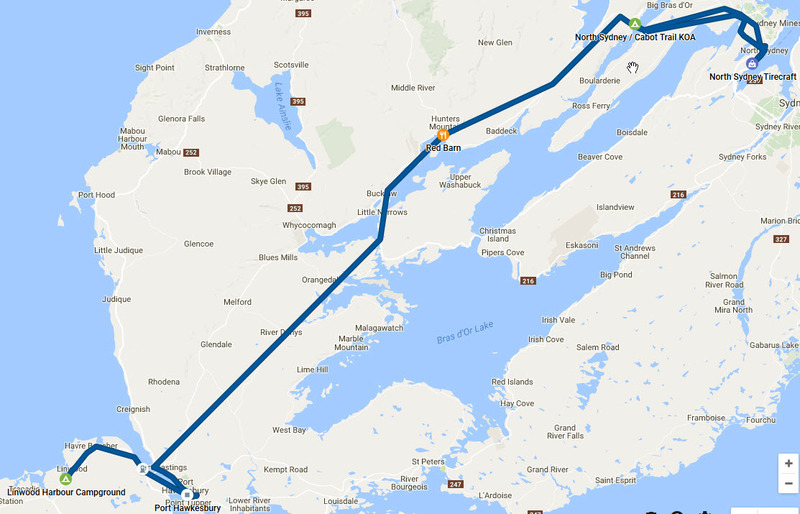 We took a breakfast break at a Tim's near Whitbourne and followed the Garmin for a bit until it was obvious that had bad coordinates. We had spotted a sign near the exit for the Holyrood Access Road so headed back there and did the old "follow the signs" thing until we found the camp. We decided it was acceptable for the present though not a great esthetic winner. We checked in for a night then, since it was just past noon, we decided to do some wandering. We head out along Conception Bay South then eventually cut over to St. John's. We took a wander through the downtown then poked our way to Quidi Vidi area and stopped at Quidi Vidi Village Plantation to explore a bit. After that we made the customary visit to Signal Hill National Historic Site and took some more pictures. We now slowly worked our way back to camp with a stop at a Sobey's near the Village Shopping Center to get some supplies. We got back about 16:45 and Lillian set about catching up some laundry while the machines at the camp were available. We wrapped up with a light dinner and some "grape juice". The main objective for today was a visit to the Vokey homestead on Vokey Road in Spaniard's Bay. 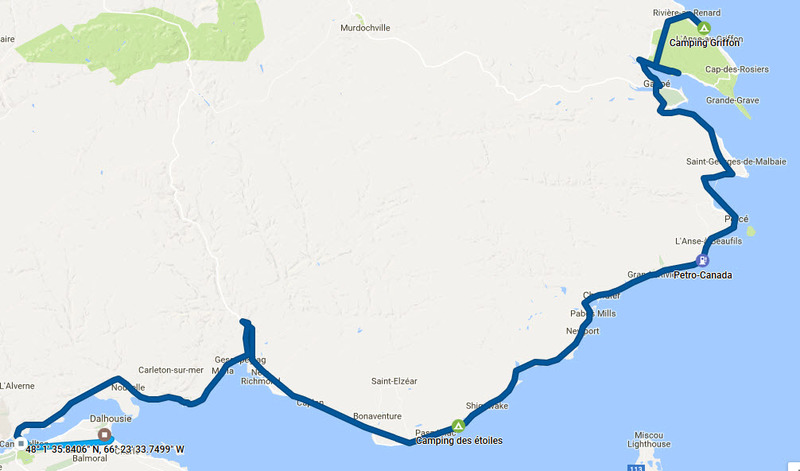 We set out about 9:10 after a good breakfast and took a fairly direct road (NL 75) up Conception Bay North to Spaniard's Bay. We parked on Bishop's Cove Shore Road at the base of Vokey's Road since it is a really steep road to ascend if you don't know you have space to land or turn around. We walked up the road about 9:50 to the first place on the left which we expected to be Keith's but there was a gentleman sitting outside who we did not recognize. Lillian, being faster up the hill made inquiries and we found out it was Keith's brother-in-law who was visiting with his wife (Alida's sister). It turns out that Keith, Lidy and Ellie are all still in place and we were given the usual great Vokey welcome. We spent the rest of the morning catching up on news and taking a nice walk up the property. We finally said our goodbyes about 12:30 and followed the shore road for a bit before picking up the highway and working our way to Bay Bulls. We found most things there pretty much shut down for the season. While we were in the area we decided to check out an rv park a bit further along the coast. On our way we stopped at The Captain's Table and treated ourselves to an excellent chowder and beer. The place we wanted to check out turned out to be very uninteresting so we headed back along the coast to St. John's where we made a couple of shopping stops and generally got to enjoy rush hour traffic. We then headed back to BlueFin Family Park where we dine on left over chicken. Not an exciting day today. We woke up to nicer weather than expected, had a light breakfast and hit the road around 09:00. Since we had basically done what we planned for the east we decided to point back west along the TCH as see how far we managed to get for the day. We made periodic fuel and biology stops along the way and stopped for a light lunch at Badger Diner. 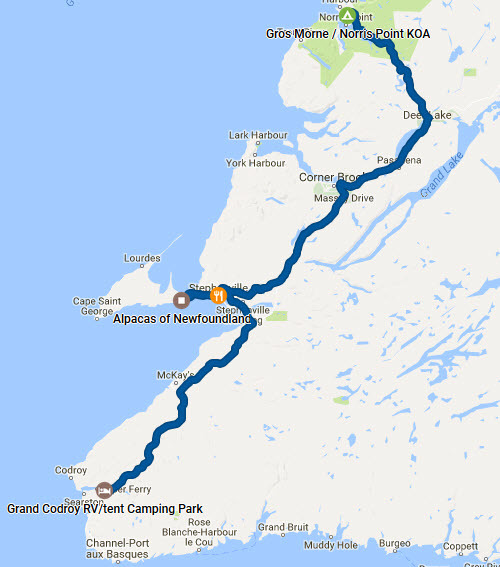 By then we decided we could make the full run back to Gros Morne / Norris Point KOA so we booked a site using the KOA app. We landed about 17:20 and got one of our old sites. The weather was much as we left it - overcast, foggy and raining lightly - siiggghhhh!!!! A good dinner out of the galley and some grape juice reduced the pain. Actually a good run for one day. 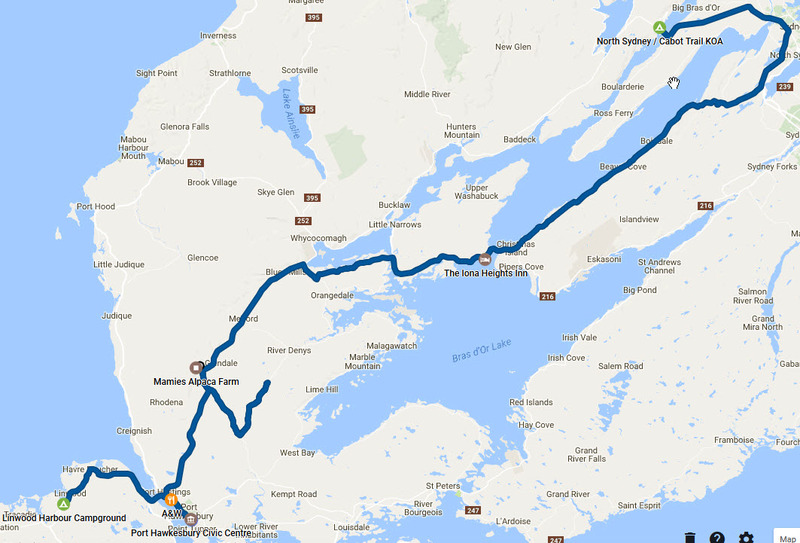 The main objective for the day was to get closer to Port-aux-Basques so we would be ready to catch a ferry back to North Sydney, NS. While we lightly toyed with catching the 23:45 ferry this evening, the default plan was to take the 11:45 tomorrow since we already know where to stay once we land. We took advantage of the low urgency day to have a nice breakfast and each grab a shower where they were free (well ... included) and decent. We finally "set sail" about 10:15. The term is appropriate since it was wet all day - ranging between drizzle and downpour. We had considered visiting the lower part of the Gros Morne National Park but the weather was just too miserable. We kept a steady pace down through Deer Lake to pick up the TCH then kept on "west" through Corner Brook. We got off the TCH near Stephenville since Lillian wanted to visit Alpacas of Newfoundland on the Port au Port Peninsula. After Lillian had a good shop there we started back to the TCH but made a stop at Hartery's Family Restaurant where we had a nice bite of lunch and a glass of wine each. Discussion over lunch decided that we would take the "noon" ferry tomorrow so Rod booked it on his tablet. We then headed back into the rain to find our way to Grand Codroy RV-tent Camping Park in the Codroy Valley. This is the closest decent RV Park to the ferry. Quite a decent place really though Internet access could be better given that cell service without a booster was marginal to missing. The rain did not stop us from having a great dinner and a pleasant evening. It finally seemed to stop about 9 PM. Supposed to be better tomorrow. We awoke to a lovely, sunny morning - almost teasing us now that we are booked to return to Nova Scotia. We packed up and hit the road for Port-aux-Basques around 07:40. We arrived shortly after 08:00. After looking around for a more interesting option we stopped at Tim's for a bite of breakfast. Around 08:45 we head over to the ferry terminal and discovered they had a decent breakfast there. We relaxed and enjoyed the nice morning while we waited for boarding. We took Weston for a good walk around the terminal so he would be well "emptied" for the voyage. We sailed pretty much on time and relaxed and enjoyed the trip. We had a decent lunch aboard and a couple of beer. We arived spot on time in North Sydney. Once we got out of the terminal we made a brief stop to give the dog a break then headed on to the North Sydney branch of Kenny's Pizza to grab a pizza "to go" for supper. From there it was straight to North Sydney / Cabot Trail KOA arriving just after 19:00. For us this was a pretty sedentary day. We woke up to a cool but beautiful morning. We had a leisurely breakfast including some homemade biscuits then Rod finally got around to grooming Weston some 5 days late. We then set off to do some shopping. A first stop was to arrange for some new tires for the Roadtrek hopefully to be installed Monday. We then set course for Mayflower Mall in Sydney where we did some shopping and grabbed a snack and a beer at East Side Mario's. We then picked up a couple of things at Canadian Tire and did some food shopping at Atlantic Superstore before heading back to camp at North Sydney / Cabot Trail KOA. Some dinner and sitting around the fire wrapped up the day. Not much to say today. Hung around camp, did laundry, had showers, relaxed, ate and drank. Visited with some nice folks from Vermont this evening. Beautiful weather, nice place - lovely, lazy day! Since we still hope to get some new tires tomorrow we are still hanging around the North Sydney area. Having caught up most of our household chores yesterday we decided to do some wandering about. The first order of the day was a trip to Leather Works By Jolene just a bit up the Cabot Trail. This was on the agenda before we ever left home. 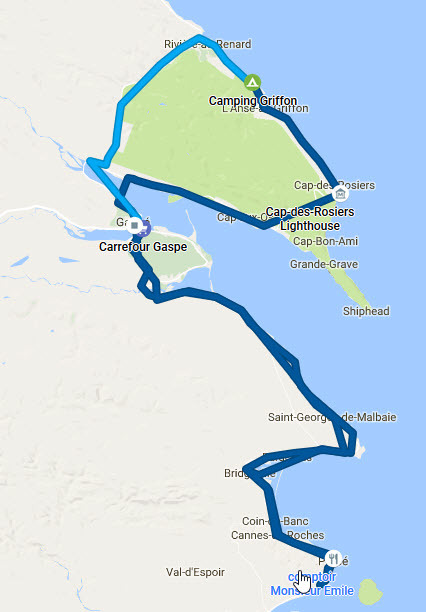 We set out about 10:20 after a light breakfast for the Englishtown Ferry to join the Cabot trail and head up to Jolene's. Once Lillian got her fix of the lovely smell of fresh-worked leather and acquired a few small items, we head back to the ferry and the TransCanada and worked our way toward Saint Anns. As we turned on to the bottom of the Cabot Trail we noticed Lobster Galley Restaurant so we popped in for a bit of lunch. 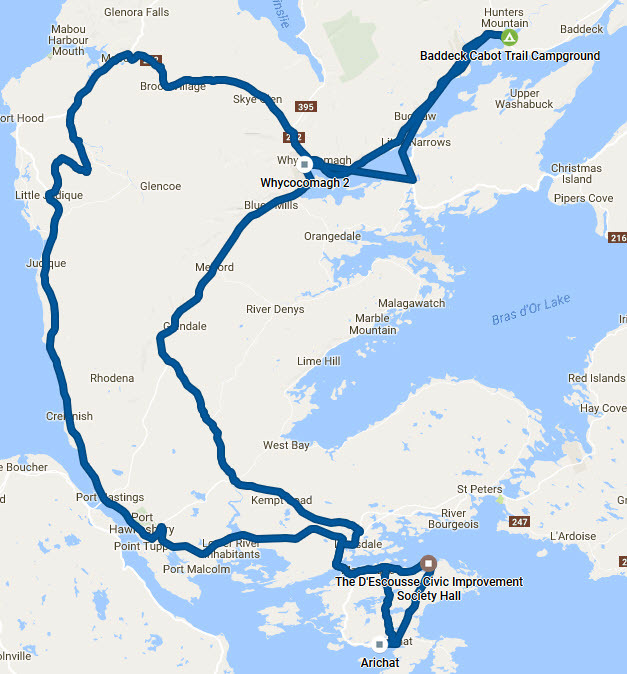 We then worked our way to The Gaelic College where we stopped in to visit the shop and case the area for potential "boondocking" locations since it is the location of the "Festival Club after-parties" during the Celtic Colours International Festival. We came away with some ideas and a CD. 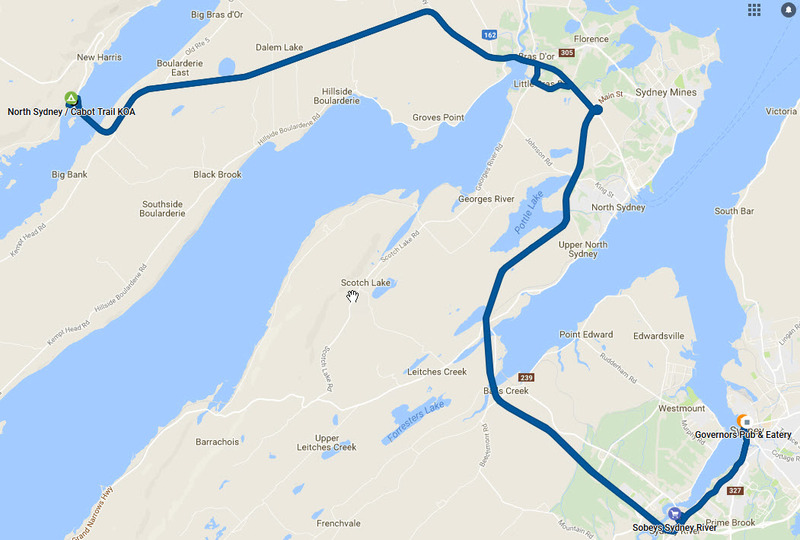 For the return to North Sydney area we decided to loop around the far side of the Bras d'Or Lakes so we went down to Aberdeen where we picked up the 223 and followed it up the east side of the lake until it met the 125 then back to the TransCanada and back to camp. For dinner we popped back over the Seal Island Bridge to grab a bite at Fitzgerald's Restaurant then back to camp for an evening by the fire. Today was a bit of a frustration. We spent the morning waiting to hear that our tires were in and we could drop by to have them installed. We even checked in mid-morning to be told the should be in shortly. Finally around noon before we pressed our checkout extension too hard, we hit the road for North Sydney. We also wanted to get accross the Seal Island Bridge since there was construction causing one-way traffic over a 2KM stretch. Our first stop was the tire dealer to check status and let them know we were in town. Most folks including the owner were on a lunch break but the lad who was there did some digging and discovered that the tires, instead of being shipped from Dartmouth as normal were actually coming from somewhere in Quebec. 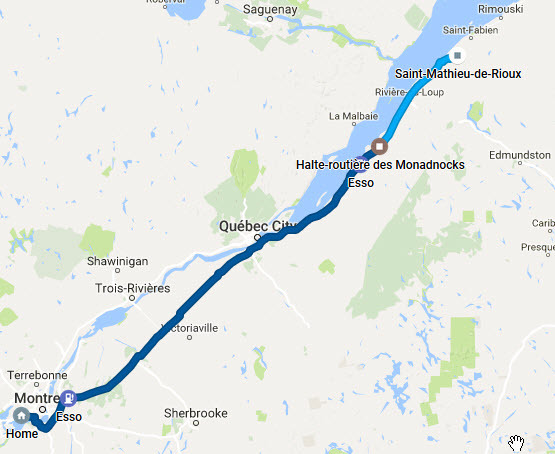 The tracking system showed them currently in transit in Dorval, QC. Go figger! 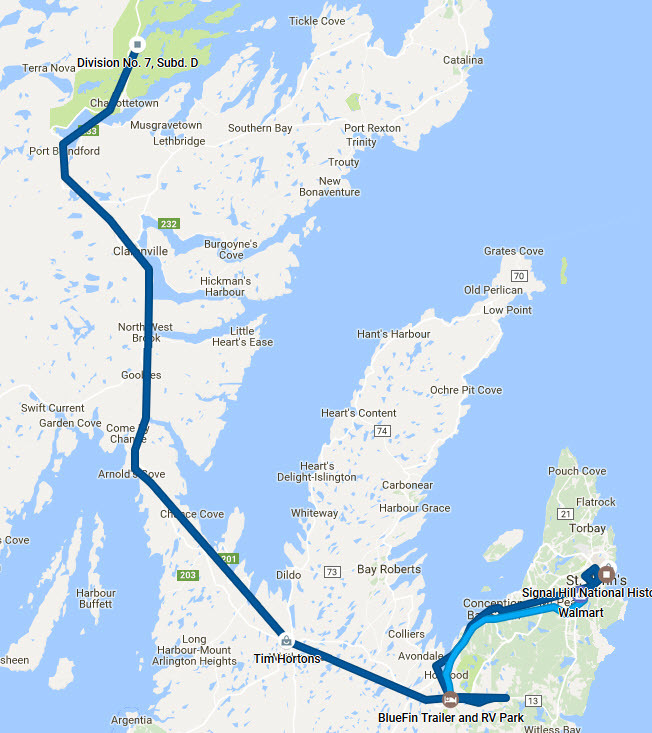 We made an appointment for when we would be back in North Sydney then decided to hit the road south for a bit before Celtic Colours begins. We first popped into Black Spoon Bistro for a chowder and salad while we fine tuned our next steps. 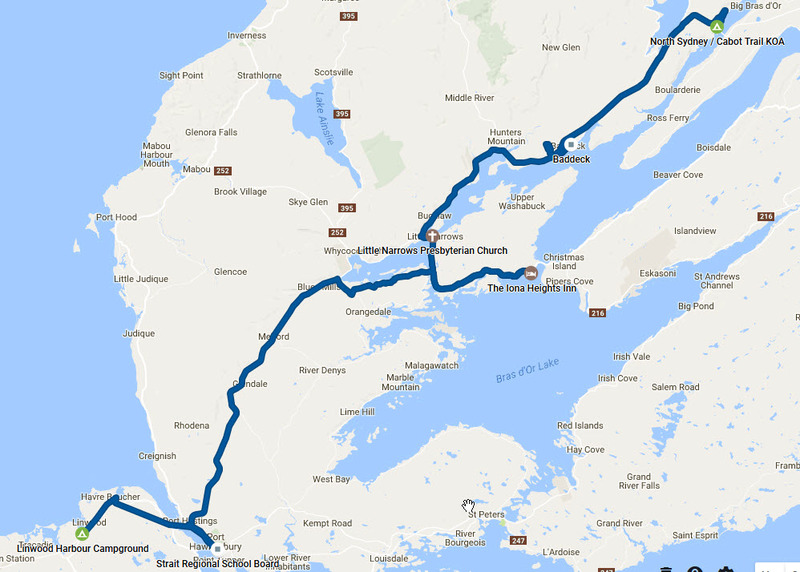 We decided that the first destination should be Annapolis Valley Wine country where we want to hunt down some wines - especially some of the nice Baco Noirs from the area. To position ourselves we decided to head for Halifax West KOA in Upper Sackville - about a 4 hour drive. While this is hardly a daunting drive for us, we did get a pretty late start. Conditions, however, were excellent and traffic pretty light so we made steady progress arriving just after 18:00. We even got our same site from last year and were immediately greeted by a couple of Mallard ducks at the waterfront. All around a successful day ended with food, wine and a camp fire. We woke to be greeted by our mallard friends on a partly cloudy but nice morning. We had some slightly "long in the tooth" Pilsbury Cinnamon Buns in the fridge so we decided to make those for breakfast. The came out just fine using our little toaster oven and we scoffed about half of the batch. We then geared up to do some wine hunting in the Annapolis Valley. We said farewell to the mallards and left camp about 10:00 and headed for the Domaine de Grand Pré Winery where we knew they had some decent Baco Noir. As we approached, we encountered Just Us! Coffee House so we popped in briefly to grab a fresh coffee for Lillian and some of their fair-trade coffee. We were impressed to see they had a free EV charging station there. Even though our plug-in vehicle is back at home we appreciate the gesture. We arrived at Domaine de Grand Pré shortly after and climbed the hill to the tasting room where Lillian (our designated taster on the road) tried a couple of their reds beyond the Baco Noir. She decided that a bottle of their Reserve Foch was required for further study as well as a couple of bottles of the 2016 Baco Noir. We then headed to the Blomidon Estate Winery. We had tried a bottle of their Baco Noir (yes - we like Baco Noir) from the NSLC and found it quite decent and we wanted to see what else they had. It turns out not much so we bought a couple of Baco's and moved on. After that we checked out Planters Ridge Winery and Lightfoot & Wolfville Vineyards but did not find much of interest. We then decided to head down the valley on route 1 towards Annapolis Royal. It was a pleasant drive and we arrived at Dunromin Campground about 15:40. Like last year there were a number of camp maps taped to the office window as well as a rate sheet saying to pick a site and pay in the morning. So we picked a site and relaxed for a bit in the 29°C weather. Around 17:45, when it a cooled a bit, we headed over to Ye Olde Towne Pub in Annapolis Royal for a bite of dinner, some cold beers on a hot day and some interesting chats with the locals. We head back to camp around 20:00 and relaxed reading and writing this of course. This morning Lillian wanted to check out a couple of shops in Annapolis Royal that she had spotted when we went in for dinner last night. Figuring most would be open by 10:00 we set off a bit after 09:45. All had been checked out by 10:30 so we picked up route 8 to head for the south shore. When starting up the Roadtrek this morning I got the "Oil Change Required" message so we moved that up the priority list. We were going to get it done when we had the tires changed but that is now too long to wait. As we went along route 8 we cut on to 208 then 235 to end up in Bridgewater shortly after noon. We then set out to find someone who could change the oil on a Ram Promaster 3500 dressed up as a motorhome. After some asking about we wound up at Silvers' Garage (2008) Ltd. who were able to take us right away. We finished up there coming on to 14:00 so we set out to find some lunch. That took us to The Local Public House at the Bridgewater Mall where Rod had a Club and Lillian a burger. Both decent. 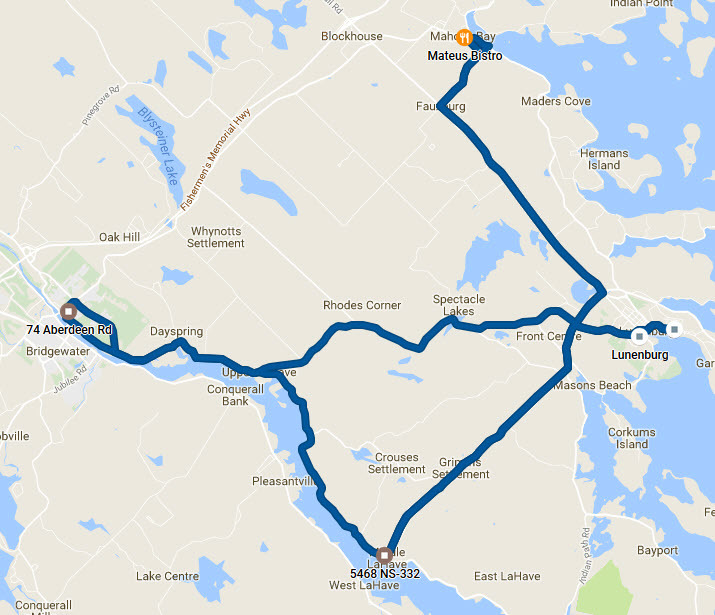 We then headed to Mahone Bay where Lillian revisited Have a Yarn for about half an hour. We then followed route 3 into Lunenburg where a couple of other shops were visited. We wound up having a beer and a snack at Grand Banker Bar & Grill. After that we headed up to "Brudder's" place in Middle Lahave to camp for the night. They were out to dinner at a neighbour's place so we just relaxed until they returned home. We then had a bit of a visit and did some planning for tomorrow befored we all headed off for the night. Today was booked by Mother Nature to rince things out with a day of rain. Since we were here and they had the patience, we decided to hang out with Rod's brother and Charlene. We rolled inside a little after 08:00 and had a bite of breakfast after which we headed off to Lunenburg Farmers' Market at the Lunenburg Community Centre. We picked up some lamb chops, a steak, some greens and some eggs while Daniel and Charlene did their own shopping. We rode around on a couple of other errands with them finally ending up at Charlene's folks place in Bridgewater. We had a nice visit along with some of Joyce's homemade apple pie. We agreed to meet later for some dinner. We then headed back to Daniel and Charlene's where we took care of our own stuff for a bit taking time out for a light lunch. Later in the afternoon D&C's neighbour Joachim and his wife popped over for a visit. Shortly after 17:00 Daniel headed off to pick up Charlene's folks in Bridgewater and the rest of us headed off at 17:30 to converge on Mateus Bistro in Mahone Bay where we had a lovely dinner to honour Lyle & Joyce's 65th anniversary as well as our 42nd and Lillian's birthday all coming up soon in October. After dinner we reversed the transport and gathered back at D&C's for a quiet wrap up to the evening. Today we resumed our tour of the Fundy coast. One of our trip objectives was to have a repeat of our anniversary dinner in Yarmouth last year. 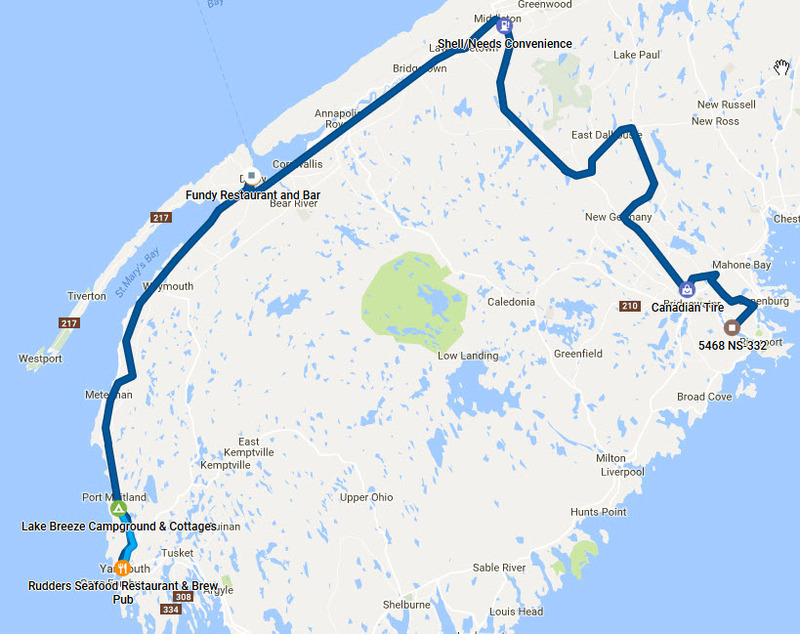 We decided to advance the date a few days since Celtic Colours starts earlier this year and we did not want to have to beat a path from Yarmouth to Sydney in a day. We had a light breakfast with D&C then Daniel set out for a meeting on the Northumberland shore and we packed up the Roadtrek and set out from "The Lighthouse" about 09:50. We headed off to pick up route 10 from Bridgewater when a message was displayed saying that the brake fluid was low. We adjusted course to stop at the Canadian Tire in Bridgewate and picked up some brake fluid. When topping up we noted it was not really low or marginally at best. We put it a splash of extra fluid just in case bit figure that the display was stimulated by stopping on a steep downslope thus possibly causing the sensor in the reservoir to be tripped. Either way, no further complaints from the RAM. We resumed our trek along route 10 and seem to have lost it somewhere around New Germany thus giving ourselves a tour along some pretty but not really efficient roads. We finally got back on track and worked our way back over to Middleton where we tanked up with gas before heading along route 1. Near Bridgetown we picked up 101 for a bit to move us along to Digby where we got off to grab some lunch and poke around for a bit. For lunch we paid a return visit to The Fundy Restaurant. where we split a couple of lunch specials. We then dropped in to Birch Street Seafoods Ltd where we picked up some frozen scallop pieces. We then head on down close to Yarmouth where we set up camp at Lake Breeze Campground & Cottages where we stayed last year on our anniversary. Since our lunch was a bit late we reserved for dinner at Rudder's Seafood Restaurant and Brew Pub for 19:00. We relaxed a bit and Lillian caught up some laundry before heading off to dinner about 18:30 as planned. At Rudder's Seafood Restaurant and Brew Pub we settled in to an excellent dinner much like last year only this time entertained by The Bill LeBlanc Band. They were our vintage and the music was a trip though our youth. The evening lived up to and exceeded our expectations. Back at camp we relaxed before packing it in for a nice day. 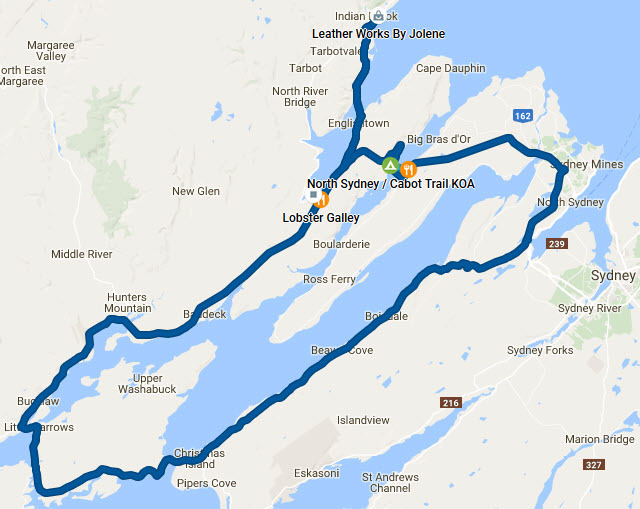 Having repeated our Rudder event a few days earlier than last year we decided it was time to start back towards Cape Breton - probably by way of the eastern shore. For today our aim was to go back to the Halifax West KOA in Upper Sackville. We set off about 9:20. It seems that the Roadtrek had another complaint. Today it is the tire pressure that wants checking. We popped in to the local Canadian Tire to pick up a suitable gauge and gave a quick check. Even though they had run a bit, all four tires were slightly low but none drastically. We stopped at a garage that had an air pump and topped up the front tires to their required level but the pump only could be set for 70 lbs. so we could not top the rear tires to the required 80 lbs. Given that they were at 75 and the van is not heavily loaded in the rear, we figured we were fine for now. Beyond that, the trip was smooth and uneventful. We made a stop for some supplies along the way and eventually turned up at the Halifax West KOA about 15:30. The boys went for a walk around the camp while Lillian did some things in the RV. We were then relaxing back when we noticed another Roadtrek pull in. It was owned by Rick, a lawyer from Penn State who was also in NS for Celtic colours. We had a nice chat and shared some "grape juice". We split up for a bit to forage for some dinner then Rick popped back to share our camp fire. We had a very pleasant evening's conversation and we look forward to crossing paths in Cape Breton. Today our plan is to work our way back to North Sydney so we could perhaps get our new tires on Monday. We took a leisurely start enjoying some St-Viateur Bagels which Rod's brother had let us know are often available at Sobeys stores. In spite of the chilly morning (on the edge of frost) we both took showers. Rod also used his $20 12V air pump found on sale at Canadian Tire to top up the Roadtrek tires while they were cold. This turns out to have been enough to finally coax the dash light to go out. We finally pulled out of the camp site about 11:00 and queued up behind a couple of others to dump the "ugly tanks" before hitting the road back North. 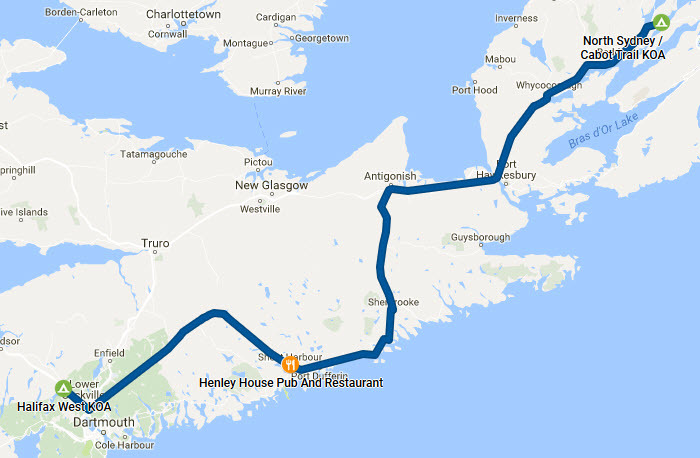 We took a scenic route along the eastern shore stopping at Henley House Pub & Restaurant in Sheet Harbour to share some beer and nachos. 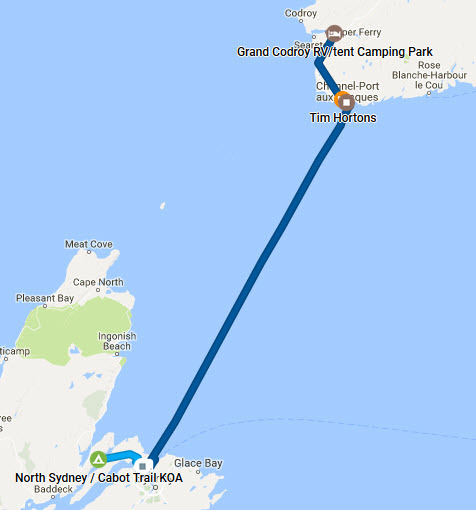 At Antigonish we picked up the TransCanada through to North Sydney / Cabot Trail KOA arriving a little after 18:00. Dinner and a camp fire wrapped up the evening. Just after 08:00 we gave a call to Tirecraft North Sydney to see when they might be able to install our new tires. 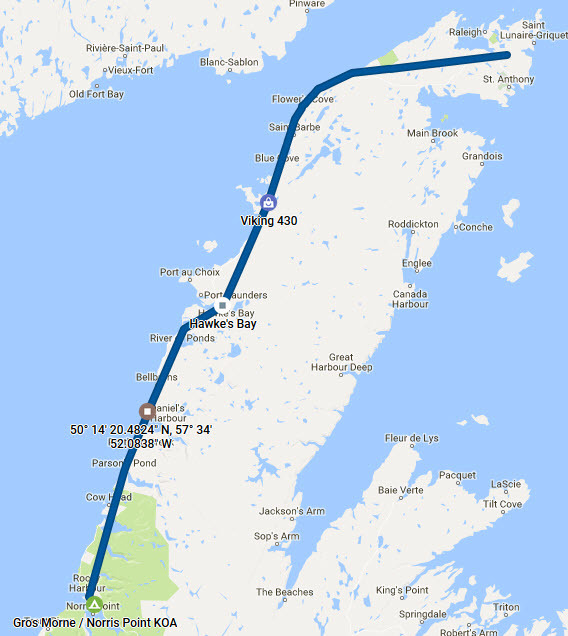 We arranged to get there for 10:00 so we had a quick breakfast, packed up and hit the road just after 09:00 since we could see that there were construction delays on the Seal Island Bridge. We arrived about 10-15 minutes early to find a hopping, busy garage. They were still operating roughly on time (maritime style). They actually started on the Roadtrek a bit after 10:15. It was a slow process since they had to work with it just outside the garage and hand jack it due to the size. All was carefully complete a little past noon though we were told that we should get all the bolts retorqued after about 100 KM just to be safe and that this could be done at any member of The Atlantic Tire Dealers Association (ATDA) for no charge. We then set off back down the TransCanada. 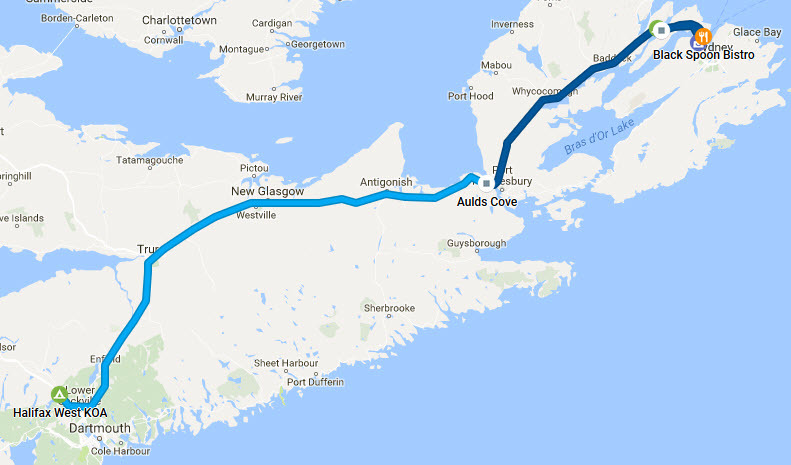 A couple of days back we heard from some friends back home that were on their way to St. Andrews, NB for the week. 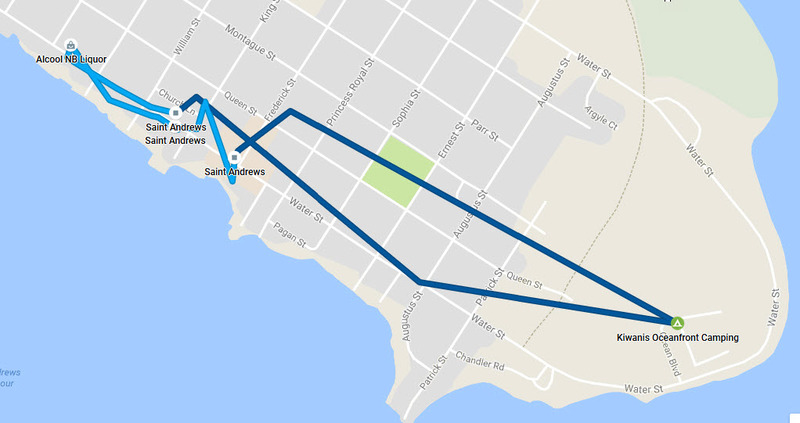 Since we had nothing specific planned before the start of Celtic Colours on Friday, we would head down to meet them and take the chance to explore the area so we were on our way. We stopped for a quick lunch at The Red Barn then continued on down to Port Hawksbury and paid a visit to Seaboard Tire Services where they retorqued the wheels in less than 5 minutes. By now it was well after 15:00 and the weather was uninspiring so we decided to pack it in early for the day. 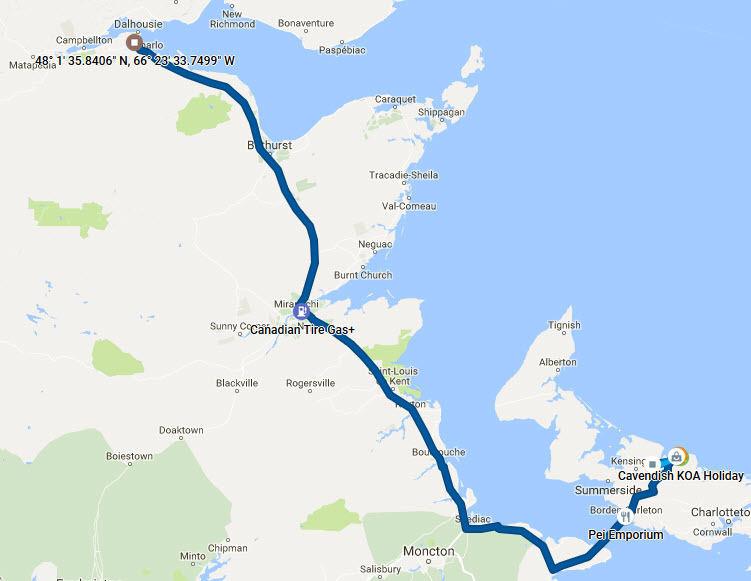 We decided to head for Linwood Harbour Campground Where we stayed a couple of times last year. We all just took a lazy evening in the shelter of the Roadtrek. We woke up to improved weather so we resumed our trek to meet our friends in St. Andrews by-the-Sea. We had a couple of other objectives for the day which included getting dog food and topping up the propane tank. Lillian also asked if we could stop briefly in Pictou on the way. We made our first stop at Global Pet Foods on Lawrence Blvd. (Albion Park Plaza) in Stellarton, NS and picked up the needed food for Weston. Just nearby we found The Appleseed Modern Diner where we stopped for a quick breakfast. Worthy of note, they make a fine corned beef hash which Rod enjoyed and then saved about 1/3 for "futures". We decided to leave the propane hunt for later and headed off to revisit Water Street Studio Co Operative in Pictou where Lillian picked up a couple of items while Rod walked Weston. We also popped in next door to Grohmann Knives where Rod could not resist a Forged 7" Santoku Knife at half price since it had some minor (cosmetic) flaws and was considered a "second". Finally we hit the road again and kept a steady pace to Moncton, NB where we went hunting for propane and gas. It took 2 tries at Canadian Tire to get one that would fill the propane. Gas was easier but we toured more of Moncton than we cared to see when trying to make time. We finally arrived at Kiwanis Oceanfront Camping about 17:40 where J was waiting for us. We set up quickly and caught up the news for the past month since we left Pointe-Claire after which we jumped into M&J's Jeep and, after a tour of the area we ended up at The Red Herring Pub for a fine dinner. We then headed back to camp and spent a pleasant evening "solving the world's problems" with the aid of some potables before rolling off to bed without updating this. 42 years! How time flies! We got underway around our usual times and found a cool but pleasant morning. After foraging for breakfast in the galley Rod finally got started giving Weston the grooming he should have had on Sunday. M also undertook the same exercise with their big Briard lad. Dogs and other chores taken care of, we all piled into the Jeep again to head into town to explore about and do some shopping. The day warmed nicely and the walking was most delightful. We stopped at The Gables Restaurant for a light lunch before resuming the shopping expedition. We got back to camp about 16:45 and started slowly assembling a fireside dinner. While we worked at it we had some entertainment when a couple of folks with bagpipes started tuning up then entertaining us for a while from the beach. As the sun set an onshore breeze started that became quite strong and cold. This drove the dining part of dinner inside M&J's motorhome. As usual we had way more food that we could consume but it was all excellent and the company better. We had a lovely evening and eventually packed it in before "the coach turned into a pumpkin". Not too much excitement today - just the return trek. We head off about 08:50 after a light breakfast. We made steady progress up to Petitcodiac, NB where we stopped for gas. There was a Tim's there so we bought so bits including a second breakfast for Rod. At Moncton we sidetracked to a Starbucks to get a fresh bag of coffee (and a couple of Lattes). We finally got back on the road after getting caught in some construction. Our next stop was the The Masstown Market near Truro where we walked the dog and picked up a few supplies. 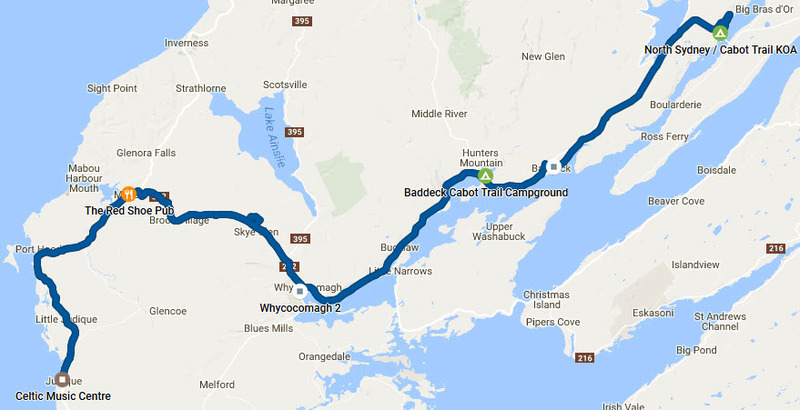 We then worked our way back up to Cape Breton eventually stopping at Baddeck Cabot Trail Campground where we checked in. We had just finished parking when our next site neighbour pulled in driving a Roadtrek. It turned out to be Rick, the lawyer we met in Upper Sackville on day 31. We expected to find him here since he told us about the place but we were really surprised to find him in the next site. We opened a bottle of "grape juice", dug up some cheese and crackers and spent the next while catching up on the past week. We then went our own ways to find some dinner and get a good night. Lillian's birthday dawned cool and a bit overcast but not unpleasant. The opening for the Celtic Colours International Festival is happening in Centre 200 in Sydney so we are moving camp back to North Sydney / Cabot Trail KOA. 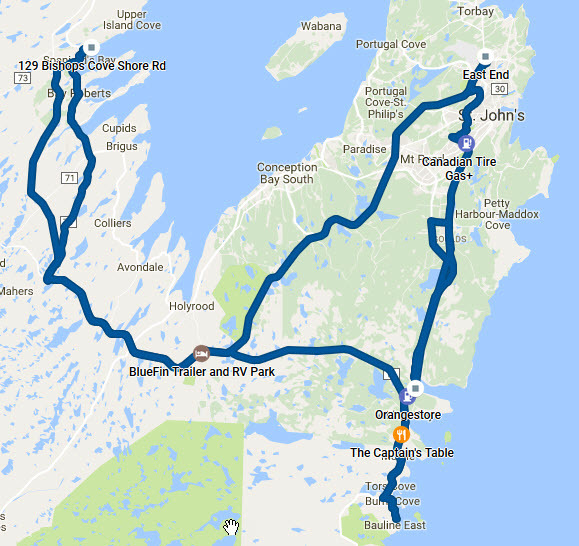 We took off a little after 10 and made a stop in Baddeck for a couple of items then continued up to and over Kelly's mountain again which brought us to the KOA about 11:20. We checked in and Lillian promptly got a couple of loads of laundry on and Rod topped up the fresh water tank. Other than that we mostly relaxed until 15:15 when we set course for Sydney. We arrived in Sydney about 16:00. Lillian wanted to make a couple of stops along Charlotte Street which we did. We then headed to Centre 200 to check out the parking situation. There appeared to be ample but to be safe we picked a spot near some other RVs then walked a couple of blocks to have some dinner at The Old Triangle Irish Alehouse where we had a leisurely birthday dinner. We eventually headed back to Centre 200 where we fed and walked Weston before heading off to the concert which was excellent. After we worked our way back to the KOA arriving just before midnight. Our next event is Women of Song in Port Hawksbury. We were also booked for Fishcakes and Fiddles being served next to the evening venue. 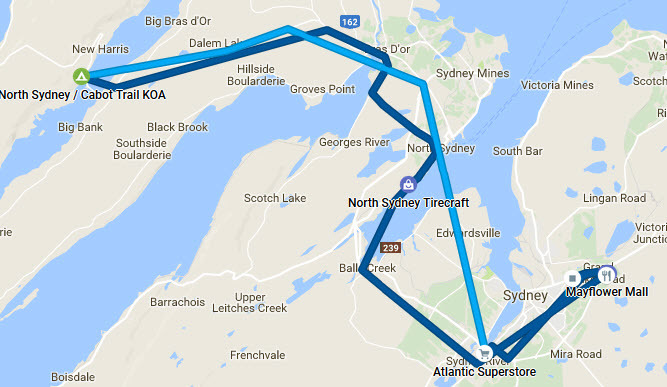 So we needed to get from North Sydney down to Port Hawksbury by about 17:00. We set off from the KOA about 11:00 and made our way to Baddeck so Lillian could visit the Fibre Festival at the Baddeck Volunteer Fire Department Community Centre. Lillian then recalled that we discussed visiting https://highlandvillage.novascotia.ca/ Highland Village near Iona so we decided to use the nice day to fit that in. It really was a nice review of the history of the Gaelic experience in Nova Scotia and the situation that drove so many Scots to the new world. 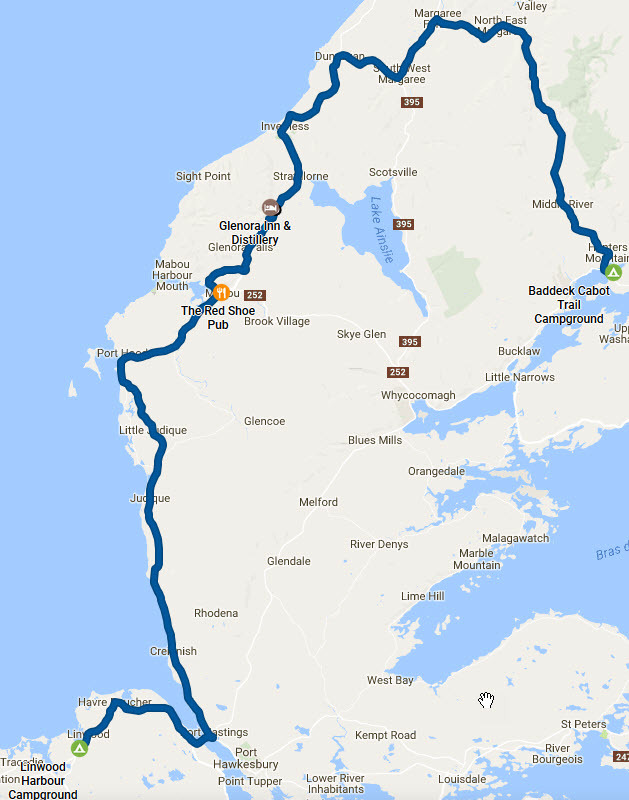 We then dropped in to https://www.ionaheightsinn.com/frolic-folk-pub-grill/ The Frolic’n Folk Pub & Grill in the The Iona Heights Inn right next door where we shared a really excellent plate of Nachos chase down with a pint each. Lillian even managed to acquire some of their homemade salsa. We then found our way to Port Hawksbury where we stopped briefly at Sobeys and NSLC before heading to our events. The dinner was adequate if not exciting though we met some nice folks including a couple from Ontario and 4 folks from South Shore NS. The concert was generally very good though the first act was uninspired and Heather repeated her set from the opening almost verbatum including the patter which was really annoying given that probably at least half the audience probably were at the opening or saw the streamed version. We then headed over to Linwood Harbour Campground where we managed to find a free site in the dark. We shared a fire with some folks from Halifax on their way home from Newfoundland. Today we have no concerts booked so we decided to do some wandering. We set off about 10:40 after a lovely breakfast of bagels, cream cheese and some smoked salmon that we found at Sobeys. We decided to head to Mabou where they had a "Farmers' Market". We arrived just before the The Red Shoe Pub was scheduled to open at noon and remembering good food from last year, we decided to have an early lunch before the place got too busy. We had a nice chat while we waited with a couple from BC that had been wandering the country for the last 2.5 months - and you thought we were bad. Lillian had wings and a salad and Rod tucked in to probably the best Chili he has had in a couple of years. We then went on to the farmers' market and had a poke around. 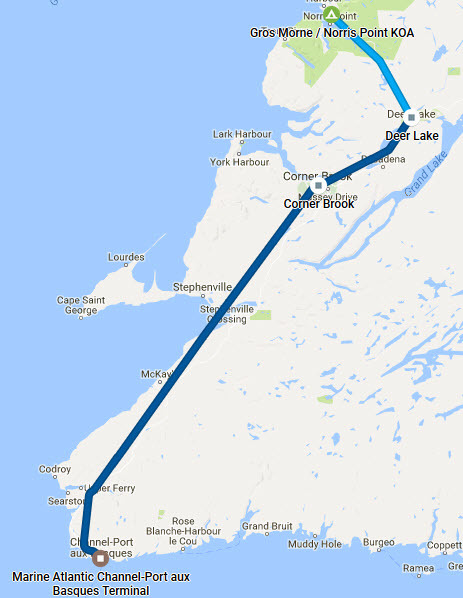 After that we decided to work our way around to Baddeck area. On the way we passed the Glenora Inn & Distillery so we popped in. Lillian did a thorough survey of the gift shop and we passed on the tour but headed right to the pub to enjoy some music, beer and a taste of their 15 year old whisky. It was quite nice but not nearly worth the price. Since the weather seemed to be deteriorating, we went on to Baddeck Cabot Trail Campground where we set up camp and just relaxed for the evening. Rick moved back beside us sometime overnight so we caught up on the last couple of days whilst sharing some of the remaining St. Viateur bagels. While flipping around the schedule and comparing plans for the day we noted John Allan Cameron Song Session in Glencoe Station. It was first come, first served with no presales so we decided to head over to see if we could get in. We arrived in ample time so parked and made some lunch while we waited. There was no trouble getting in and it was a great session with lots of music and stories. A real trip down memory lane. We pulled out a bit early to make our way to a Turkey Dinner in Arichat which was excellent. We then headed over to the venue for Acadian Roots where we met up with Rick again. The concert was most enjoyable and included a lively group from back in Montreal "Bon Débarras". It was also nice seeing Cyril MacPhee again. Weather was a bit rainy as we started the trek back to Baddeck Cabot Trail Campground In spite of a stop for gas, we got back a few minutes ahead of Rick and we both managed to back into our narrow sites in the dark without incident. Since it was already tomorrow, we hit the sack. Our next couple of concerts are in the Sydney area so we decided to move camp to North Sydney / Cabot Trail KOA. We had some breakfast and packed up, said good bye to Rick and hit the road about 11:00 and arrived at the KOA about 40 minutes later. We checked in and caught up on the local news then took a quiet afternoon since the weather was a bit iffy. At about 15:30 we head off for Seafood Chowder at the Dobson a yacht club across from the cruise ship terminal in Sydney Harbour. We were pleased to see the MS Rotterdam in harbour. This is the same ship we sailed on last Christmas and New years. The chowder was excellent and conversation also interesting. We eventually moved over to the venue for the evening concert Songs from Scratch. We parked next to a Winnebago Era and had a chance to chat with the owners from the Ottawa area. We were interested in their impressions since we had looked at a couple of used Era's when we were looking at motorhomes last summer before we settled on the Roadtrek. The concert itself was superb. It significantly exceeded expectations which were high given the talent involved. These folks had been "locked away" together for a week and came up with 17 origional songs amongst them. We hope they were all recorded since there were some real "keepers". The performances were also outstanding. A great evening. After the concert we went straight back to camp. Today dawned a bit more dry than we had expected. By the time we really got moving the sun was out and Lillian had some things out to dry. After a leisurely breakfast Rod took the time and weather opportunity to give Weston a good grooming. We took care of some other chores including updating this document a bit before finally heading off to Sydney a little after 16:00. We made a quick stop at Sobeys near Sydney for a few supplies before heading on to Governors Pub & Eatery where we were able to squeeze in. Lillian ordered a lobster roll that was on special and Rod ordered their pork back ribs which past experience told us were excellent. Nothing was disappointing or left on plates (other than a few fries). The concert for the evening was A Tribute to Leon Dubinsky which was excellent. Leon, his wife and daughter were all there and participated in the second half of the show. Overall it was a great review of Leon's work over the years (follow links for more) and the show, of course, wrapped up with a rousing version of "We Rise Again" which I am sure most of the audience were also hearing the late Raylene Rankin hit the big notes. A most enjoyable evening. After the concert it was back to camp to relax, catch this up and hit the sack. Today the action is all around the The Celtic Music Interpretive Centre in Judique so we decided to move camp back to Baddeck Cabot Trail Campground for the night. After breakfast and a shower we set off about 10:30. We made a quick stop in Baddeck for some coffee and $$$ then proceeded on to the camp where we checked in and dumped the "ugly tanks". We did not even back in to the site but rather headed off to Judique by way of Mabou which is probably the shortest route. Since we were passing through Mabou we popped in to The Red Shoe Pub so Rod could have another sample of their Chilli. It really is exceptional. We arrived at The Celtic Music Interpretive Centre around 14:00 and found a place to park where we could easily walk Weston. We then relaxed until Tunes & Talk with Alison Brown started at 15:00. It was a very interesting session on the history of the banjo with some great "tunes" included. We held on to our table for the Seafood Choices Dinner where Lillian had the chowder and Rod had the haddock. We then went back to the Roadtrek to feed and walk Weston and relax until the evening concert. While walking Weston, Rod ran into J. P. Cormier having a smoke outside the stage end of the community center. He had just driven in from Calgary and had picked up a cold that has been going around. We kept our distance. The concert for today was the Celtic Guitar Summit. As one would expect with the talent on stage, it was an evening of spectacular picking. After the concert we took our time retracing our route back to the camp. Rick turned up about 1/2 hour later from his concert Deep Roots, Many Branches where Rhiannon Giddens particularly "knocked his socks off". We did not recognize the name but we did some checking and found she was a member of "The Carolina Chocolate Drops" which we had enjoyed previously. The coach was now a pumpkin so we hit the sack. We started the day sharing a pot of coffee with Rick comparing notes for the festival and solving other world problems. Since this is our last stay at Baddeck Cabot Trail Campground for this year we would not be seeing Rick again. We exchanged coordinates and headed out about 10:30. Lillian spotted a sign for Baadeck Yarns on the highway and asked if we could visit - which we did. We then rolled on to North Sydney / Cabot Trail KOA. where we checked in and stopped to relax and enjoy a light lunch. Rod caught up this travelogue and Lillian read. About 15:45 we set course for downtown Sydney. We parked in a large lot near the Sydney Waterfront Boardwalk and headed up to see if we could squeeze in to Governors Pub & Eatery again - which we did. We had another amazing dinner - pan-fried haddock for Lillian and a lobster roll for Rod. After dinner we went back to the RV to feed and walk Weston and generally relax until show time. The show tonight was Big Ceilidh at the Big Fiddle which was held at "The Big Fiddle" a.k.a. Joan Harriss Cruise Pavilion. This is the same place we saw the MS Rotterdam docked the other day and the same place we docked on the MS Veendam a year ago May. The concert was enjoyable though not the best of the week. It was nice seeing Cherish The Ladies again - it has been many years since we last saw them. We then rolled back to camp and crashed for the day. It's our last day in Cape Breton and the grand finale for Celtic Colours for this year. It has been another amazing festival. We know of no other like it being spread out over a vast geographic area and lasting the bulk of 10 days. This morning we bid farewell to Jason and Bonnie and the rest of the gang at North Sydney / Cabot Trail KOA. Lillian asked if we could route by Jill's Chocolates located in the The Iona Heights Inn. We managed to fit it in. Unfortunately we were too early to pop in for another batch of natchos in the pub. We had considered visiting the locks at St. Peter's Canal National Historic Site but noticed we were a couple of days too late. We then set course for Mamie's Alpaca Farm. The GPS took us on a bit of a side track but we eventually used Google Maps to get us to the right place. It was very interesting. These folks are just getting started and are progressing well. We had a nice tour and a nice chat. Gas was getting low so we headed for Port Hawkbury and tanked up. There was also an A&W handy so we popped in for a burger. We then wandered over to Sobeys for a couple of items and used the same stop to visit the NSLC to pick up some NS potables to take home. We then went over to the Civic Centre and found a parking spot suitable for the Roadtrek and close to the entrance. We went in for a bit to visit a couple of exhibits then went back to the van to relax until show time. We also had a light dinner while we were waiting and took "His Hairyness" for a nice walk. The show tonight was, of course, The Grand Finale. It was a good show. Like Rick, we were blown away by Rhiannon Giddens - WOW! After the show we set course for Linwood Harbour Campground saying farewell to Cape Breton as we crossed the Canso Causeway back to "the mainland". We managed to find a site and back in for the night. We will see them in the morning. All pictures have now been uploaded but they are very raw. They have not been culled, cropped or rotated and the viewer is basic. This at least allows some look at the pictures until we get time to work on them. Right now our priority is to prepare get our garage floor refinished by Zone Garage. Also note that the pictures from Lillian's Panasonic (suffix P) may be out of sequence since that camera is not time zone sensitive.